I have been meaning to post this for the last couple of weeks but working on my book has kept from doing so. The SF Chronicle posted a collections of colorized photos taken to promote the Southern Pacific’s rail line from Los Angeles to Portland. Of the 115 or so images 7 them are of the Mount Shasta area. Skip to images 85-92 to view the Mount Shasta area images. They are a fine gateway into the history of this region (and California and Oregon in general) and make for intriguing discussion pieces. While this is not exactly hiking related, I find historical documents like this intriguing for a few reasons. It is interesting to try to determine what has and has not changed. It is also useful for picking up clues to places that people once frequented that are not longer “on the map”. Spots like Summit Lake and the Ruby Pearl Mine are places that I have been alerted to through historical documents that are no longer “advertised” anymore. Some of their locations are obvious, such as Mossbrae Falls and Shasta Springs Resort. Other locations are a little less specific. Of the two shots of Mount Shasta, one is probably from near Sisson’s Lodge, which was located near the museum and fish hatchery while the second is presumably from the climb up to Castle Lake. 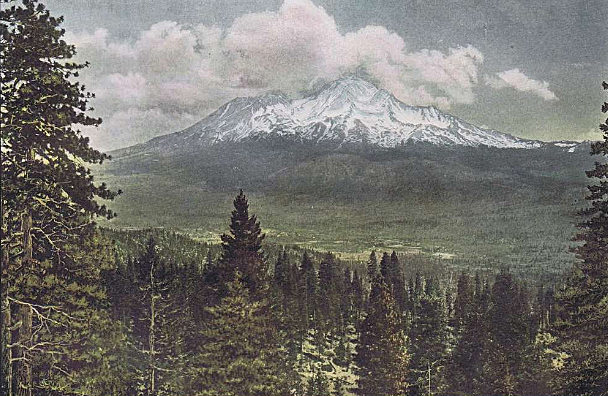 The shot of Black Butte, notably referred to as Muir’s Peak (click here for more on John Muir’s connection to Mount Shasta), is more enigmatic. The shape of the peak indicates a westerly perspective. However, it is definitely not the view from Mills Meadow. The only realistic possibilities for where that image could have been taken from are a springtime, flooded Kaiser Meadow (I think this is possible but unlikely) or possibly Abrams Lake (without the RV park). Interestingly, both are right along the rail line. If anyone can identify this spot, I would love to know where exactly it is! I tend to be a sucker for this kind of thing and I am always on the lookout for interesting Mount Shasta artifacts. This is a pretty cool collection that gives us a glimpse of how things used to be and how the land has resisted change. Great images — if you can find the locations you should do a rephotography shoot. Interesting to compare then and now. 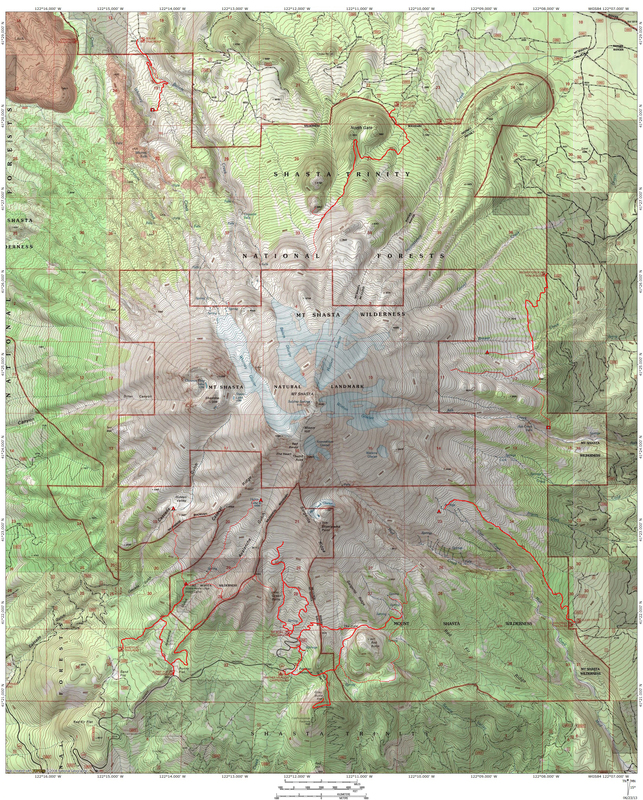 Could the mystery spot be the now-dry Summit Lake, off the South Weed I-5 exit and down some forest service roads? The perspective looks a bit like that area, at least if I’m remembering my many hikes there properly. 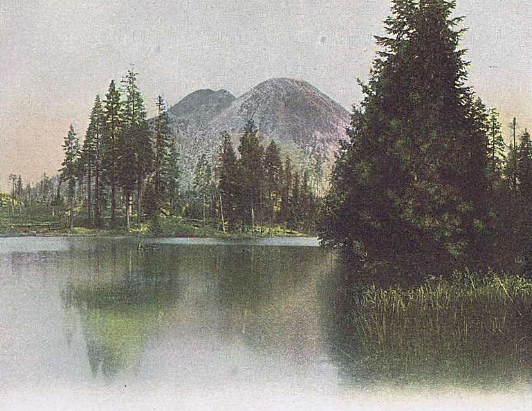 I have a calendar photo taken in 1950 of “Black Butte from Sunfish Lake” that looks like this. Same view angle of the butte. Same angle as a view from the Abrams Lake area. Heard that there was a Lake Eleanor (that is now dry) in same area. I could post photos if someone points me to the proper link for that. Hi Doug. I completely missed this comment when you posted it back in June and for that I am very sorry. I was down in the Carson-Iceberg Wilderness at the time and did not see it when I got back. I am very interested in what you have, if you are still willing to share!